Each wipe kills 99.9% of viruses and bacteria on hard, nonporous surfaces when used as directed. Ready-to-use wipes in a convenient pop-up container. Lemon and Lime Blossom Scent. 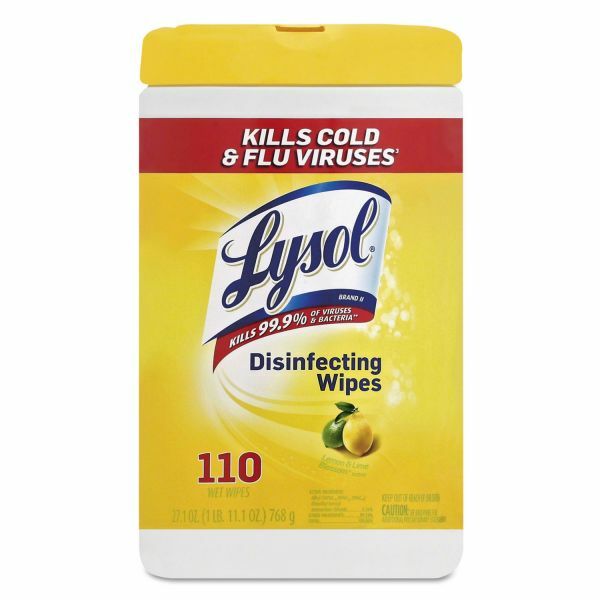 LYSOL Brand Disinfecting Wipes, 7 x 8, White, Lemon And Lime Blossom Scent, 110/Canister - Lysol disinfecting wipes kill 99.9 percent of viruses and bacteria on hard nonporous surfaces when used as directed. 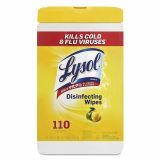 Thick, pre-moistened wipes with a lemon/lime blossom scent are designed for use on kitchen counters, appliances, stovetops, cabinets, floors, garbage cans, toilet exteriors, bathtubs, sinks and more to clean, disinfect and deodorize. They remove 95 percent of allergens. Airtight canister package keeps wipes moist and effective. Pop-up tub easily dispenses one Lysol wipe at a time.